Austria-based Starlinger introduces its latest AD*STAR conversion line series, ad*starKON SX, for poly-woven block bottom sack production that offers fast production speed, high precision bottom closure and quick format change. 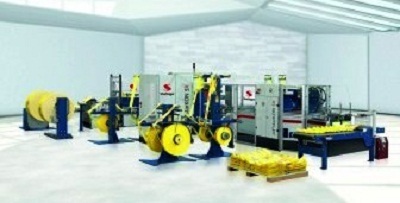 Designed for the economic production of standard, open mouth, two-ply, pocket valve and BOPP laminated AD*STAR sacks the conversion line runs at a production speed of up to 85 sacks/minute, with a pin-free continuous sack transport system and highly precise bottom forming system ensuring reliable bottom and top closure without harming the fabric. In converting, high production efficiency means quick material roll change and format change, little machine downtime and a low waste rate. All these criteria have been taken into account in the development, emphasizes Starlinger. Even if the width of the tape fabric on a roll used for sack production varies, the ad*starKON SX is able to convert it into block bottom valve sacks. An integrated fabric width monitoring system continuously checks the fabric width and automatically compensates width variations to ensure constant high quality bottom geometry. This does not only avoid unnecessary machine stops but also reduces the number of rejects. And changing the sack format is done automatically by key press on the main control panel.